To celebrate the 60th anniversary of the Treaty of Rome, the French National Bar Council, the Paris Bar and the Conference of Bar Presidents organised an event at the premises of the French National Bar Council to recall the advances made by European law and question the candidates for the French presidential elections about their European projects. President Pascal Eydoux opened the day of celebration by recalling the origins of the Treaty of Rome, which brought about the European Economic Community and planted the seeds of the single market. The political courage which enabled the signing of these treaties in 1957 is sadly lacking today and it is clear that the European project is no longer a priority, for neither the current political leaders nor the candidates for the presidential elections. 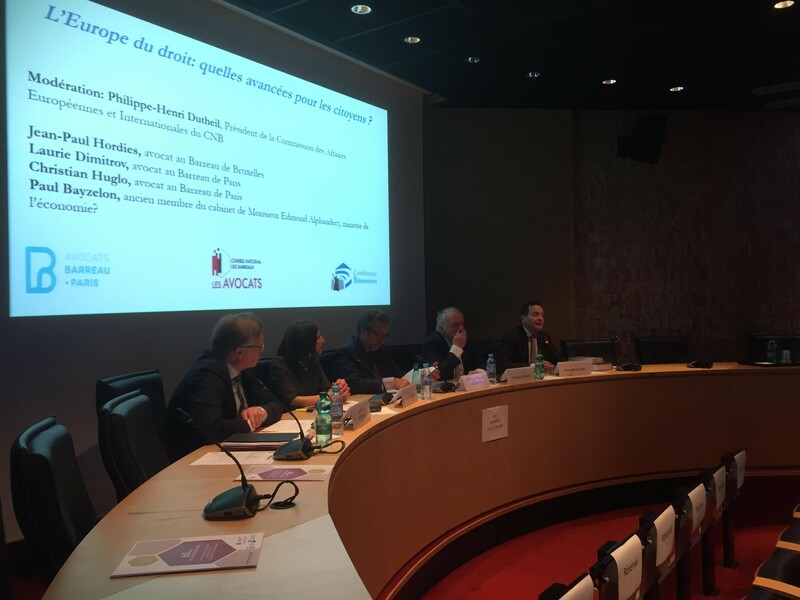 The first round-table of the day, chaired by Philippe-Henri Dutheil, President of the European and International Affairs Committee of the French National Bar Council, examined the achievements and progresses of European law which are to the benefit of citizens. Hence the speakers, each from the standpoint of his own specialty, presented the advantages brought by European law and the risks which would stem from a less inclusive Europe: lawyer Jean-Paul Hordies of the Paris and Brussels Bars on labour law, lawyer Laurie Dimitrov of the Paris Bar on family law, lawyer Christian Huglo of the Paris Bar on environmental law and lastly Paul Bayzelon, father of the European Code of Business Law to consolidate the Euro. 1st round table: The Europe of Law: what progresses have been made for citizens? 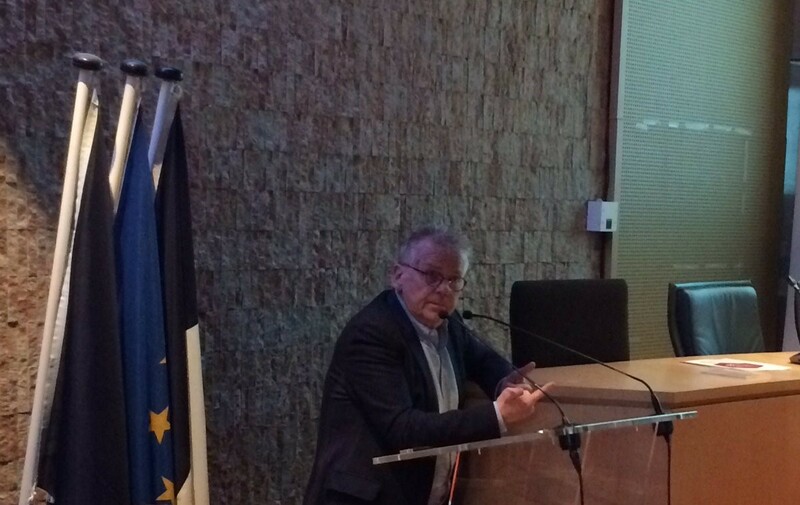 Daniel Cohn-Bendit then spoke to reiterate the importance of a strong, efficient Europe – a political and social Europe as well as an economic Europe. He reiterated that the European Union has already won one battle – and perhaps the most important one, that of peace in Europe. We now need to build on this solid basis of friendship between peoples, for instance by encouraging and developing initiatives which contribute to bringing peoples closer together. An example of this is the Erasmus programme which, if it were extended to apprenticeships, students and young workers, would make it possible to create generations of truly European citizens. The President of the Conference of Bar Presidents, Yves Mahiu and the President of the Paris Bar, Frédéric Sicard, also spoke in favour of a greater Europe, before leaving the floor to Michel Benichou, former president of the CCBE, to moderate the round table which brought together the representatives of the presidential elections for them to present their European projects. Jeanne Chevalier represented the candidate Jean-Luc Mélenchon, Virginie Rozière represented the candidate Benoît Hamon, Clément Beaune represented the candidate Emmanuel Macron, Etienne de Poncins presented the European project of François Fillon and Bertrand Dutheil de la Rochère represented the candidate Marine Le Pen. The public reminded the various representatives of the major headway that Europe had made, which needs to be continued rather than weakened. While candidates such as Fillon, Le Pen or Mélenchon seem to favour propositions to leave or modify the ECHR, the French Bar would like to reiterate its attachment to this mechanism which protects human rights and the rule of law. Europe must remain a united, rights-based Europe.